Feel yourself whisked back to the avant-garde art scene of late-19th-century Paris at the Des Moines Art Center’s new exhibit, “L’estampe originale: Painters, Printers, Paris.” The Print Gallery exhibit features 36 prints from the Art Center’s Permanent Collections by artists such as Paul Cezanne, Henri de Toulouse-Lautrec, Edouard Vuillard and Pierre Bonnard. Avant-garde printmaking rapidly increased in Paris during the late 1890s and early 1900s, spurred by new approaches to color lithography and etching as well as innovative collaborations between artists, printers and publishers. 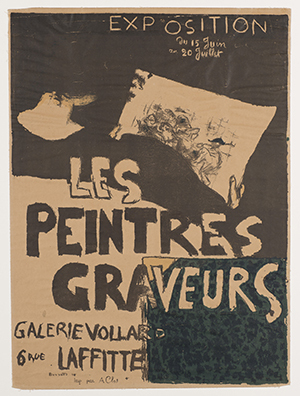 Pictured: Pierre Bonnard (French 1867-1947), “Les Peintres Graveurs” (“The Painter-Printmakers”) (1896), lithograph on paper, Des Moines Art Center Permanent Collections.